I am using Fire TV Stick from the last 1 year. I am very much happy with the device. It has all the required features to turn your normal TV into smart. Smooth interface with no lags and compatibility with most of the Apps except the Google Apps. It totally does the job for media viewing experience. Video added to show a demo of the interface and Alexa Functionality in the device. Hope it helps. Do check if your TV supports a Universal Remote for controlling. Not every brand or model does that. So ON/OFF, Volume Control and mute might or might not work. The new remote that has IR feature now, can Turn your TV ON/OFF and control the TV Volume. This is a very practical move which should have been included in the previous version. 2. Intuitive interface with curated content. 3. No stuttering or hangs with good internet speed. 5. Casting support for Prime Videos, Youtube Videos. 6. Option to sideload Apks. 8. Remote app available to control from phone. 9. Alexa for voice search. 10. Above all, its a stand alone device unlike chromecast. 1. The screen mirroring has a slight lag, making it not suitable for gaming from phone. 2. Voice search in the remote works only for the content in Prime Video. 3. Does not have a great game collection. 4. Limited storage and no SD card support. 6. No option to add another amazon account. Only one account at a time. If you are OK with using two remotes, you can buy the previous version that is available at discounted price. But if you don't, then buy this without any hesitation. Either way you will have a great device for your family. I just wish they increased the internal storage at least in this version. So one star reduced only for that. 1.0 out of 5 starsIn this version inbuild app Jio Cinema isn't working. Don't buy this version now if you want to play Jio Cinema moves. I am very sad as movies in Jio Cinema aren't streaming in this advanced version of Amazon firestick though it was working fine in previous version. Media files Jio cinema are alway in buffer mode and not playing at all. Moreover HotStar takes around 10 mins to launch. My WiFi speed is 50 Mbps. I trusted the brand so I bought in relaunch only without checking the review of the device and this made me unhappy with the big brand like amazon. I will return this advanced version and buy the initial version. Prime Video's are streaming very well that's why i am giving rating 1. Very very nice product. After using it i have disconnected my DTH connection as it is useless. If u have a good data pack with mobile or broadband or dungle then use fire stick, not DTH. Aftet TRAI new rule, it is exepensive to see the normal paid channels. I have a request to Jio to provide JioTV app for fire stick. 4.0 out of 5 starsWorking fine. Every thing is working fine but volume button and power button is not working. Please help someone. 1.0 out of 5 starsAmazon firestick is a waste product and blocks firefox internet media content without reason. I am totally disappointed with the product, i wish to get the refund of Amazon firestick. The product is adamant and Amazon decides what we have to watch on TV. I couldn't find most of the Indian media TV apps in this device store.Some news channels are not even playing after repeated reinstallation, for example Times Now App. Even after i opted to watch those News channels on firefox, still not able to screen it on TV says unrecognized media content. This is a very disappointing product and i would like to know the refund process. Works good as android phone ! Just install aptoid tv n boom ! Ur ready to go watch live tv ,movies n more if u have fiber broadband .... u can mirror ur android ,windows ,ios ,mac devices via 3rd party app. Just install aptoid tv via es file explore.. NOTE -i have 100mbps fiber broadband so live tv and movies ready to watch ! I had this device in wish list since launch. Was very excited to find it being launched in our country. With cost of internet going down significantly & good content availability since few years, Amazons FireTV is undoubtedly the best option. My TV was already smart along with Mira-cast support so I avoided it for long. Then LG stopped supporting this model & its app store degraded with time having less or no content/apps. I still ignored this as I was very much occupied with mobile and content. Then came another headache with TRAI rules which significantly increased pricing of DTH packages, with 1/4th of earlier channels at same price. So I thought now is the time to switch to this wonderful fire TV device & extend things beyond DTH channels with several of streaming services at our disposal, all via big screen instead of small mobile screen. A perfect streaming device which brings in Alexa voice smartness & goodness of Internet TV with curated content by several providers. As add on you also get Screen Mirroring (Miracast) & Cast. It’s a world of entertainment contained in small Android platform based standalone HDMI stick with 1000’s of movies, TV shows, apps etc, all in Full HD (1080p). Number of apps are preinstalled with a lot of FREE content and you are free to install others. P.S. Min connection speed of 4Mbps is recommended for pleasant experience. 1. Good quality, solid build device with easy setup (make sure to use high speed broadband instead of mobile hotspot, else be ready for ‘amazon home not reachable’ issue). 2. Fully capable standalone streaming device based on Android platform. 3. Highly capable Bluetooth remote with Alexa voice support. It does not require pointing to device. 4. Remote also has IR capability for general TV functions (on/off/volume/mute). This requires pointing to TV’s receiver. 5. Mobile app available to control device. So dependency on physical remote is less. 6. Intuitive, fast & snappy interface without significant lag. It lags if music or install task is running in background. 7. Rich curated free content with almost all of streaming services supported. Prime, Netflix, Hotstar, SonyLiv, Spotify, Gaana etc. Premium content requires subscription. 8. Capable Amazon app store to find many of required apps. 9. Since android based, you can just side load any other android app.Compatibility is another thing. 10. Supports Screen cast/Mirroring/Mira-cast. So covers up Chrome-cast as well. 14. Deep integration with Prime video and music. Alexa voice or fireTV search will not work for content of other apps. It though works fine for music across other apps. 15. It comes preregistered to Amazon account used to make purchase. 16. Compatible with smart home devices via Alexa enabled remote. E.g. Philips Hue, Smart switches, Cameras etc. 17. Sufficiently long USB power cable. 18. Remote range is more than 55 feet. I was able to check up to 55 feet and it worked well. 1. Biggest issue is the search which is exclusive to Prime content. For rest it displays browser or YouTube link. For such a streaming device, search should extend across all apps. P.S. It works ok for playing music across other apps. If songs not found on prime, it searches it on others and play accordingly or you can even specify app. 2. Limited storage with no card support. So you are left with only ~5 GB for deployment. 3. Since it’s just another HDMI device connected to TV so if you switch inputs and does not exit streaming content on Fire TV, it keeps on running and consuming data. 4. Sending device to sleep does not auto switch off TV unlike waking up which switches it on. It need to be manually done. 5. No Google Playstore support & Amazon store has limited apps. 6. No YouTube native app. 7. Costly accessories be it remote or Ethernet adapter. 8. Screen mirror is slow with ~1 sec delay but so happens with TV’s built in Miracast too. You just can’t avoid this lag due to high bandwidth & processing requirement. Here cons are having slight affect on functionality of device. For that 1 star deducted. So a 4 star device. # Now a day’s Alexa works well in Indian context and can very well understand the accent. # Can control compatible TV with same remote. No need to manage multiple remotes. Supported options: on/off, volume +/- & mute. # Prime Video, Netflix, Hotstar, SonyLiv, Zee5, Voot etc for video content while Prime Music, Gaana, Spotify etc for audio content. # Subscription may be required for premium content while some may be ad supported. Lots of free content available on all of apps though. # At least one subscription of your choice is recommended. Prime may be a good choice owing to extra benefits. # Regular TV shows are available without subscription on all of apps after 1 day. # News channel live app are available. # To mirror, either long press home button and select 'Mirroring' or choose that option from settings. Then toggle use corresponsing option on mobile or laptop. # It’s different from screen cast in way that, screen cast just mirrors whatever’s on mobile screen to TV while cast only casts relevant content be it video or audio on Fire TV via its app. # Many of apps on mobile like Prime music, Prime Video, Netflix etc will have cast or watch now option. # Interactive interface with apps and content on main screen. # Top part have tabs that split up main screen into Home, Movies, TV Shows, Apps, and Settings. # Video quality, reboot, reset to factory settings, deregister device etc options also available. # While on other TV inputs, pressing home button takes TV to FireTV input. # Screensaver option is nice to have. You can have your own set of images by uploading to available cloud storage. # Regular updates provided by Amazon. 1. Connect Fire TV to HDMI port of TV directly or via HDMI extender. 2. Connect USB cable to Fire TV and adapter. 3. Insert adapter in socket. 4. Switch on power supply. It boots up with ‘Amazon’ text followed by colourful ‘FireTV stick’ text. 5. Install batteries in remote & follow on screen instructions to pair it. A press of home button required on prompt. 6. Follow on screen instructions for initial setup, Wi-Fi configuration etc. 7. If not preregistered, follow on screen instructions for same. 8. Enjoy the world of internet based content & you will just forget DTH, cable TV and all. ▶ System interface is smooth except for if music or any download/ install task in running in background. 1. Easy pairing of remote. Just follow on screen instructions. Press home button on prompt, amber led flashes & upon pairing blue led flashes. 4. Press and hold voice button, to give voice commands or interact with Alexa. 5. IR control viz on/off, volume up/down, mute requires pointing to TV or other device. 6. IR setup is launched on first start up. Plays an audio & asks to adjust volume. Switches different IR codes to find compatible one. Works similar to MI phones IR remote app configuration. 7. Remote firmware is also updated from time to time. Takes approx. 2-3 min. There’s wonderful app on Playstore which works as an alternative to remote with full functionality including Alexa voice. In fact it will ease up your typing across FireTV interface with regular keyboard on mobile screen. Also helpful in copy paste operations across Fire OS. Having a built in store is a plus as you don’t need to fiddle around for apps. Amazon app store is quite good with a good set of required apps for devices core functionality. Prime apps come preinstalled. Some useful apps are listed. Still it’s limited and not as rich as Playstore. So for others, since device is android based, use your imagination. You can side load just any apk via wireless transfer. Download via web browser is disabled. Compatibility matters here as all are not optimized for TV experience. a) Install ES Explorer on mobile & FireTV. b) On your Fire TV, go to Settings → Device → Developer Options & turn on 'Allow apps from Unknown Sources’. c) Download desired apk on mobile. d) Transfer to FireTV using ES to ES LAN transfer and install. 4K version of Fire TV comes with some goodies like 4K content support, slightly better processor to support 4K content, HDR videos, Dolby Atmos, BT 5.0 etc but are they worth 2k extra you need to pay? ▶ Major hurdle here is 4K content availability. Our country is still catching up with Full HD content. 4K is far from reality for at least a few years. Rest features can be easily neglected. ▶ 4K version lacks screen mirroring. So if its a big deal for you, then its. UPDATE: With latest update version 6.2.6.3 Miracast is now supported. You can always upgrade later on as these devices are not meant to last forever. Two or three years later, you will feel the need to upgrade. Getting a 4K stick then, will make a lot of sense. Even having a 4K TV at present is not a good idea. It’s a gimmick for now which looks good on store display with optimized 4K content, but useless in real world. ▶ If you want to convert you old TV or even old smart TV (my case) with limited content to full featured smart TV with lots of content from different providers, Alexa goodness & smart home control, you are good to go with this Fire TV stick. ▶ In fact it can even act as replacement for DTH as all of channels are live with premium/subscription packages for apps or you can watch your favourite shows a day later on respective apps. ▶ If on previous generation of FireTV stick, upgrade only if you need new remote with IR functionality. Rest hardware is same. ▶ Then there’s 4K version of Fire TV. General suggestion would be to avoid it for now and save some bucks for subscription services, unless you want extra performance. 4K stick's performance is 1.5 to 2 times as compared to 1080p stick. But an average user won't notice the difference. Future proofing is another thing. As every electronic device tends to slow down after say a year or two. ▶ We also have MI TV box and other android TV boxes available. 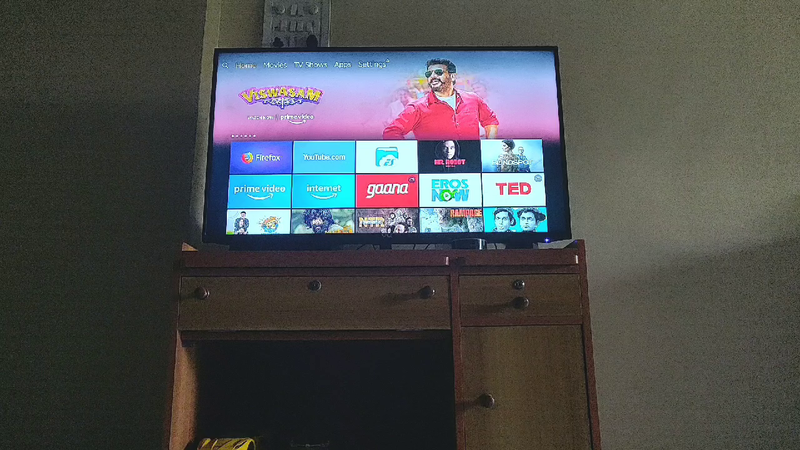 MI TV box is not officially launched here while other boxes are have quality issues. 5.0 out of 5 starsAmazing Device. Must Buy. 5.0 out of 5 starsSuper happy with fire stick & I recommend to buy if you dont have one already. First impression was bad due to a bug in the software where it was not able to connect to my 5GHz wifi, but next day i.e 25th of Jan with a software update issue is resolved. From a product perspective, it is completly lag free in operation unless your installing an app and trying to navigate away from the screen it is little slow. Usually installing the app doesnt take much time so this is not at all a big problem. Even though the remote makes use of IR blaster for volume control and switch off tv, it is really powerful it doesn't need to be in a straight line of sight with the tv for operation. Firestick also pairs with my echo dot and works well with the alexa remote as well. So it is super convenient. Overall me & my family is happy with the product.